Electrodes & Battery ordered separately. The Zoll's AED Pro® Automated External Defibrillator is a flexible, simple yet advanced device to suit those without excessive formal CPR or medical training as well as professional rescuers. Only half of victims of sudden cardiac arrest (SCA) actually require a shock to restart their hearts. Conversely, the vast majority of them need to receive skilled cardiopulmonary resuscitation (CPR). The AED Pro® features full CPR assistance as well as the capability to provide advanced monitoring and transform into a manual defibrillator for users well-versed in defibrillation techniques, supporting laymen, BLS and ALS responders alike. Its rugged, portable design makes it perfect for use in any and every setting. Real CPR Help® coaches responders to perform CPR correctly with real-time feedback, prompting users to begin compressions, push harder, and continue CPR, along with messages confirming that the CPR is being done effectively. It displays compression depth, compression rate, and lapse time indicators to ensure that CPR is consistent, properly timed, and deep enough; it also combines all three compression functions into the CPR Index™, one visual indicator that allows users to view the quality of their CPR efforts and adjust as necessary. Audio prompting urges users to "push harder" (accompanied by a bar graph showing depth of compressions) and "continue CPR," and exhorts "good compressions" when CPR is done correctly. The monitor is also capable of transmitting CPR data for review and playback of resuscitation efforts. CPR is frequently interrupted unnecessarily to determine if a viable heart rhythm has developed. This cuts down on valuable lifesaving CPR time. See-Thru CPR allows responders to see heart rhythm in real time while performing CPR without stopping. It displays a filtered signal by separating the underlying heart rhythm from compression artifact so that rescuers don't have to stop multiple times in order to check if a shockable rhythm has been established. 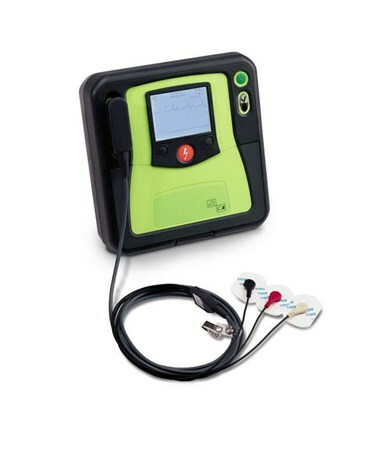 The AED Pro® supports advanced life support (ALS) responders with a configurable patient vital signs monitor. It includes a three-lead cable for basic monitoring with ECG electrodes, a manual override switch to change the AED into a full manual defibrillator with heart rate displays, and a high resolution LCD display for easy viewing of patient heart rhythm with auto-gaining technology that confines the ECG trace to a determined range. These features support those versed in advanced resuscitation and help them make an informed decision when and how to treat the victim. 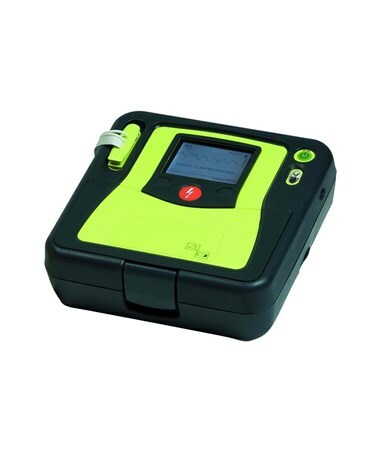 The AED is crafted of rugged, durable polycarbonate siloxane resin - the same material used in professional sports helmets - with rubber over-molds. It weighs less than 6.5 pounds for easy portability. The device's small size, durability, and powerful capabilities make it the perfect choice for heavy usage and harsh environments - EMS vehicles, emergency rooms, and even military quarters and battlefields. It boasts an unmatched IP55 water and dust ingress rating and can survive 1.5 meter drops unscathed. 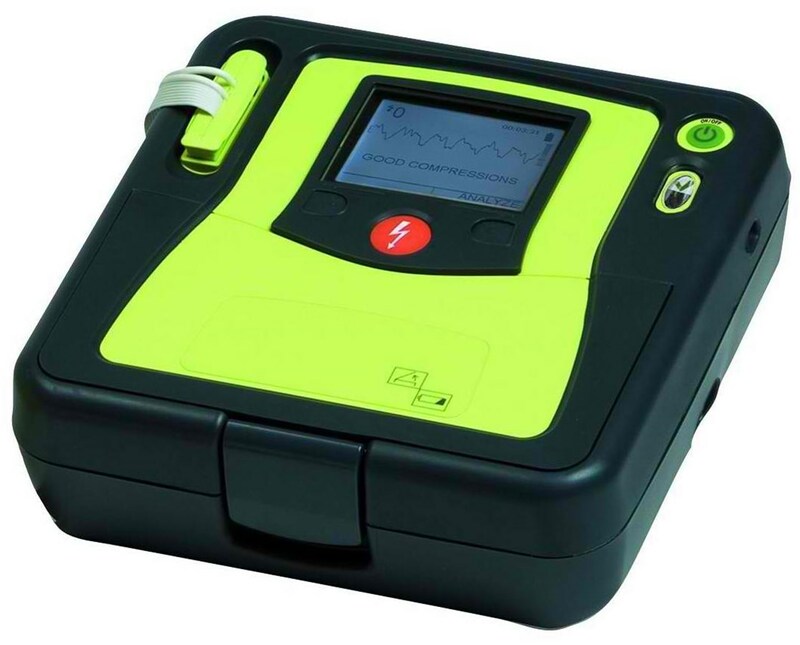 The AED Pro® is unique in that it is capable of USB data storage and transfer. It can store up to 5.8 hours of event data up to four rescues, then seamlessly transfers the data via USB port. Its external IrDA port allows infrared data transfer without cables or drives. The device includes a soft carrying case for additional portability. It is compatible with CPR-D-padz® electrodes (used in Zoll's full line of defibrillators) and the same batteries as the E, M, and R Series defibrillators for uniformity among devices, cutting down on confusion and over-ordering. Electrodes and batteries are sold separately. You can order this AED right now, online - simply click "add to cart" for hassle-free ordering at the lowest price! Energy Selections 50, 70, 85 joules (pediatric); 120, 150, 200 joules (adult) preconfigured. Dimensions 3" x 9.2" x 9.4"